The last separate category I'd like to talk about is dump trucks. 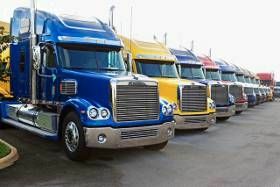 I wanted to mention a few important points about these trucks in particular because they are so common and yet are surprisingly dangerous in a number of ways you may not be aware of. First let me mention one minor point. Trucking companies which have 18 wheelers DO NOT consider dump trucks as driving experience per say. When those companies mention experience, they generally only consider other 18 wheelers as experience. I personally think this is a huge mistake on their part. To safely navigate a large dump truck day in and day out can be just as difficult, if not MORE difficult, than an 18 wheeler. If I was hiring someone for a job in an 18 wheeler I would be quite happy to find someone with safe dump trucking experience. Let's take a look at why that is. First of all, the maximum gross weight of an 18 wheeler is 80,000 pounds. A tri-axle dump truck can gross nearly the same in most states, maybe a few thousand pounds less. Yet a dump truck only has 3 rear axles with brakes on them, an 18 wheeler has four. Believe me it makes a difference in stopping power. To safely navigate a large dump truck day in and day out can be just as difficult, if not MORE difficult, than an 18 wheeler. Secondly, a dump truck usually carries loads with a MUCH higher center of gravity which makes them much easier to tip over. Thirdly, a dump truck is often operated in off-road conditions. If you can handle a 72,000 pound dump truck with a high center of gravity on a hilly, soft dirt road or driveway, you can handle anything. Not to mention you have to find stable, level ground to be able to hold you upright while you are dumping that load. Not at all an easy task. Lastly, like any local job, dump trucks are operated on normal streets in stop and go conditions. They are extremely heavy, not the easiest to stop sometimes, have a high center of gravity, and traffic is flying all around you. This is no easy job let me tell you. Finally, the pay is usually pretty lousy and the hours are quite unpredictable. The work is quite seasonal in the northern parts of the country also. You can usually expect anywhere from $10-$16 per hour with the number of hours worked in a week ranging from zero in the winter to 70 or more during good weather weeks in the summer. Because of the difficulty of handling these vehicles, I don't recommend this type of job for a brand new driver. It can be done, but I would be more comfortable having a driver start out in a vehicle with a little bit less to worry about. Please do not consider taking one of these opportunities with less than one year under your belt. Please. We've all seen the double trailers and in some places triple trailer combinations. I'm not going into this area of trucking in this book because I am gearing this book toward drivers that are new to the industry. Doubles and triples can be extremely dangerous to handle especially on slick roads. Most of these companies will not, and SHOULD not, allow a brand new driver the opportunity to drive these trucks. If by chance you do find a company that will I STRONGLY suggest you get experience driving a standard tractor trailer for at least one full year before considering making this move. These companies have excellent pay, benefits, and home time packages but again, the truck is extremely difficult to handle under adverse conditions.